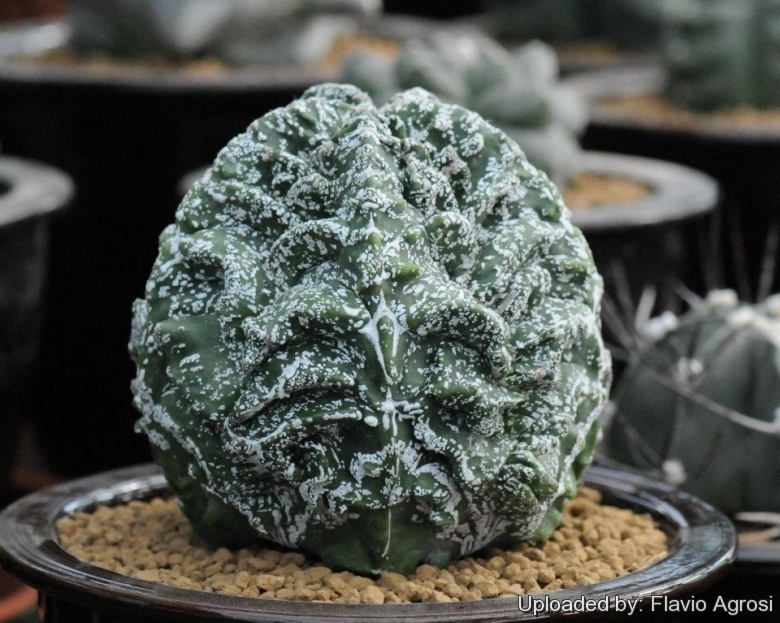 Description: This peculiar plant is the result of crossbreeding between the two of most famous Astropytum myriostigma cultivars Astrophytum myriostigma cv. Hanakago and Astrophytum myriostigma cv. Hakuun nudum and shows some interesting intermediate features of both the parents. These hybrids have inherited by cv. Hanakago the very wrinkled appearance, almost "crumpled" and recalling the shape of an Aztekium ritteri and by cv. Hakuun nudum the characteristic maculate (spotted) epidermis (with white cloud-like patches) .The flowers are also very beautiful. Stem: Pentagonal to almost spherical that looks something like an extreme form of Astrophytum myriostigma cv. Fukuryu (type B) nudum.) with horizontal raised-up Fukuryu patterns. The small rib-like wrinkles which appear transversely on the true ribs cuts the continuity of the ribs and the plants appears decorated with a geometrical design which is raised above the surface. The stems is smooth lacking or mostly lacking white flecks, but maculate (spotted) with white cloud-like patches and can be 5-10 cm in diameter.